Twice this fall Jay and I spent Sunday afternoons watching football and eating popcorn. He loved it—especially the popcorn part—so you can imagine his excitement when I told him there was an even BIGGER football game coming up that would feature even MORE snacks. “Is it Sunday yet,” he asked me this past Saturday morning, just as he had everyday for the past week. “No, Sunday is tomorrow,” I replied. Despite all the hype, Jay’s Super Bowl ended early. The most exciting part of the day for him was ninety-minutes before kickoff when we opened the first bag of potato chips and moved the television to the corner of the house where NBC comes in best. Halfway through the first quarter we packed him and his cold off to bed. He fell asleep with his vaporizer bubbling, still believing that Tom Brady is a hero. A year earlier, however, the Super Bowl had yielded what was then, and maybe still is, the single greatest experience of Jay’s life. There was no Wally yet, and we were still living on Pine Street in Philadelphia. My college roommates Rob and John came over to watch the game—Steelers vs. Packers—bearing a case of Pabst Blue Ribbon, leftover from a party a few months back. Just before the game started Caroline and John’s wife Brittany went out to get pizza. After they’d left, the four boys settled in: Rob, John, and I on the couch, each with a fresh PBR, Jay in his booster seat eating raisins. Five minutes into the game the first cheering opportunity arose. Steelers running back Rashard Mendenhall ran to the right. He broke one tackle, then another. “Gooooo!” we yelled. When he was finally brought down 15-yards later John, Rob, and I clapped and cheered and clinked our cans. Jay looked at us wide-eyed, ready to cry. But after that he got the hang of it. On the next play Mendenhall ran for nine more yards. We yelled “Goooo, goooo!” and Jay joined in, starting just a second behind us and continuing to cheer a second after we’d stopped. Then two plays later the Steelers were forced to punt. On the next drive the Packers started moving the ball. Packers quarterback Aaron Rodgers completed a short pass over the middle. “Booo,” we yelled lustily. “Booo,” Jay joined in, his fist in the air, his whole body straining towards the TV. For the underdog Steelers things went downhill from there, but for Jay and the three of us the game only got better. Jay stopped waiting for us to initiate the cheers and started breaking into them on his own. Sometimes he’d boo the Steelers or cheer the Packers. We tried to help him calibrate his support but after awhile we just went right along with him. 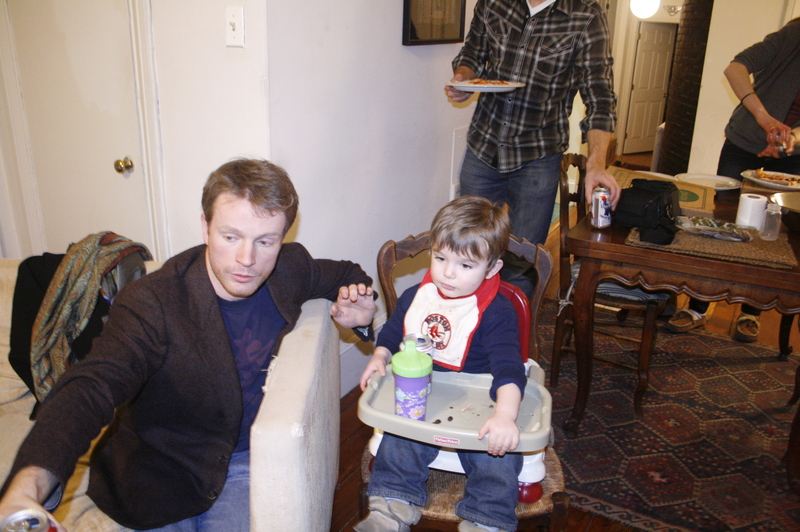 We also taught him how to do “cheers”—raising our beer cans to his sippy cup. Round and round we went—Booo! Cheers! Go!—working ourselves into a state of collective euphoria. When I think back to that night it feels like that experience with Jay went on for hours but in reality it couldn’t have lasted more than twenty-five minutes. Caroline and Brittany came back with the pizza and soon after that it was time for Jay to go to bed. The air went out of the room after he was gone. Minus our initiate sports fan, the PBR cans were just PBR cans again. The pizza was just pizza. The Steelers were down 21-10 at the half. Later Caroline reported that Jay had been almost quivering when she’d laid him down on his changing pad. She said she’d never seen him so excited. For my part, I remember thinking afterwards that had Jay been a little older, he probably would have remembered that night for the rest of his life. I’m almost certain that I will. This entry was posted in Stories & Reflections and tagged kid learns about sports, Pabst Blue Ribbon, Packers, sportsfans, Steelers, Super Bowl by Kevin Hartnett. Bookmark the permalink.